"Peter VS. the Wolf" begins with the sounds of a prison break, with a police radio announcing that the Wolf has just escaped from the zoo. To elude the police pursuit, the Wolf runs into the concert hall, and he pleads his case with the audience. He tells the audience he never ate the duck, claims that he was "framed," and then begins to tell the story of what happened at his trial. The lights then come up on the stage, where we see the orchestra and a courtroom, with the Judge, the District Attorney, Peter, the Court Reporter, and the Wolf. The DA then proceeds to present the "narrator's affidavit" as to what happened in the meadow on the day of the alleged "duckicide." With the DA narrating, the orchestra plays Prokofiev's "Peter and the Wolf" as written, broken up into five sections. At the end of each section, the Wolf calls one of each family of instruments to the stand, and cross-examines them. The Wolf's questions are a vehicle for each instrument being individually demonstrated and explained. At the same time, the Wolf manages to find legal/musical technicalities which result in every instrument's testimony being ruled inadmissable as evidence. With all of the evidence tossed out, it looks like the Wolf is about to be found innocent. 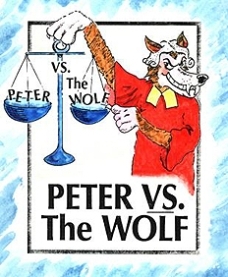 But Peter, bright and resourceful as ever, points out that besides the instruments that have already testified, there are two other instruments in "Peter and the Wolf" which have "no character": the trumpet and the trombone. In spite of the Wolf's objections, the Judge allows them to testify, and they play a brief dixieland version of the story. This testimony, combined with the Wolf having an awful tummy ache whenever the duck theme is played, results in some confusion on the part of the Judge. She seeks the expert opinion of the audience and the orchestra, and, based on that advice, finds him guilty. The Wolf pleads his case with the audience, to no avail. He then turns himself in, only to discover that he has been pardoned by the governor; but before the show ends, the truth of the matter is revealed to the audience in no uncertain terms. This amusing musical memoir of Justin Locke's years as a professional bass player will have you chuckling for hours. Read excerpts, ordering info, and more. 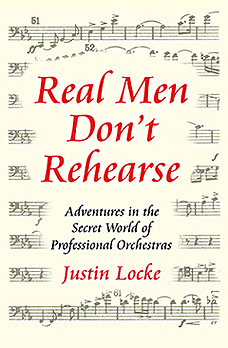 Real Men Don't Rehearse is not sold in bookstores! Now in its 8th printing. Just $14.95+s&h.